The Social Realism Art Movement was an international movement with slight parallels to the Expressionist Movement that occurred at roughly the same time. The latter was focused on presenting art subjectively, as a means of expressing emotional meaning or feelings rather than as mere objective physical reality. Social Realism in the United States is often represented by the iconic 1930 "American Gothic” by Grant Wood. The intention of the movement was to draw attention to the plight of members of the poor working class, extending criticism to the social structures allowing for the wide discrepancy between the social classes. 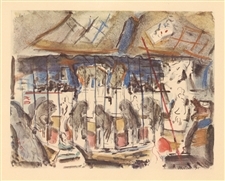 The Ashcan School of artists was loosely organized around 1900 by a group of American scene painting artists concentrating on conditions then existing in the slums of New York City, often in rebellion against American Impressionism which was, at the time, the most respected art style in the US. In this section we feature artists of the American Scene painting movement, selected Ashcan School lithographs and etchings and a variety of American Realism prints that can be loosely associated with the Social Realism art movement. Jack Levine signed original etching "Sacrifice of Isaac"
Medium: original etching, drypoint and engraving. Signed in pencil and numbered 47/100. The catalogue reference is Prescott 60. 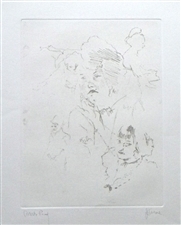 This etching was executed in 1974 and issued in an edition of 100 on watermarked Arches wove paper. The plate size is 13 3/4 x 10 3/4 inches. With full original margins, the total sheet measures 22 x 15 inches. The publisher's dry stamp is in the margin. Condition: there is some discoloration in the top margin, but not affecting the etched image. Reginald Marsh original etching "Wooden Horses"
Medium: original etching. One of the better known Reginald Marsh etchings, this impression is from the edition of 100, issued by the Whitney Museum in 1969. The catalogue reference is Sasowsky 171 vi/vi. The image measures 7 7/8 x 13 1/8 inches (198 x 334mm). Numbered in pencil 21/100, this is a fine dark impression bearing the Whitney Museum stamp. Provenance: this piece was originally sold by Associated American Artists, of New York, and their vintage certificate will be included. Condition: the area of the image is age-toned (light-struck) from having been framed. Also, the sheet has been dry-mounted (laid down) onto the mat; although all evidence indicates the materials to be acid-free, given the complete absence of browning to the outer margins not exposed to light. One margin is slightly irregular, but all are more than sufficient. Otherwise in fine condition, with no foxing, stains, tears or repairs. Only 21 copies were issued for the first edition in 1936, and these now bring a small fortune. This edition is itself now quite rare, and is an excellent value. 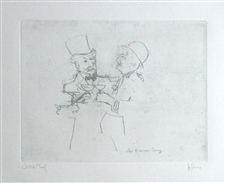 Jack Levine signed original etching "Hong Kong Tailor"
Medium: original etching with drypoint. Signed in pencil and numbered 47/100. Catalogue reference: Prescott 59. 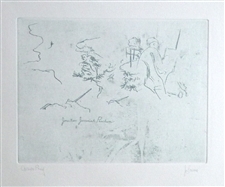 This etching was executed in 1974 and issued in an edition of 100 on watermarked Arches wove paper. The plate size is 6 3/4 x 4 7/8 inches (172 x 124 mm). With full original margins, the total sheet measures 15 x 11 inches. The publisher's dry stamp is in the margin. A magnificent, rich impression, signed in pencil by Jack Levine. 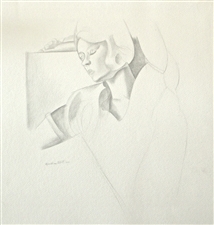 Gerald Brockhurst signed etching "Marquett"
Medium: original etching. Signed both in the plate and in pencil. Catalogue reference Fletcher 51. Executed in 1925 and issued in an edition of 106 (not individually numbered). Plate size: 8 3/8 x 6 3/4 inches (215 x 173 mm). A nice impression on watermarked laid paper, the full sheet measures 16 x 10 1/2 inches. 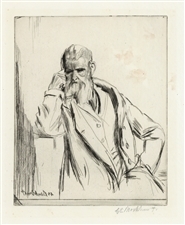 Marquett was a wood engraver who also sat for another Brockhurst etching. Edward Wadsworth original woodcut "Portrait of a Boy (Rupert Doone)"
Medium: original woodcut. Catalogue reference: Colnaghi 142. Published in London in 1921 by Herbert Furst at the Little Art Rooms for inclusion in the "Modern Woodcutters 4" volume, now very rare, which showcased original Edward Wadsworth woodcuts. This impression was printed on Basingwerk Parchment wove paper by Walter Bradley at the Morland Press. The image measures 7 x 3 inches. Not signed. Edward Wadsworth original woodcut "Head (Rupert Doone)"
Medium: original woodcut. Catalogue reference: Colnaghi 144. Published in London in 1921 by Herbert Furst at the Little Art Rooms for inclusion in the "Modern Woodcutters 4" volume, now very rare, which showcased original Edward Wadsworth woodcuts. This impression was printed on Basingwerk Parchment wove paper by Walter Bradley at the Morland Press. The image measures 5 1/2 x 3 inches. Not signed. 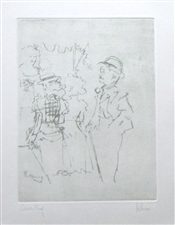 Raphael Soyer signed / numbered etching and aquatint "Friends"
Medium: original etching and aquatint. Issued in 1973. Signed in pencil by Raphael Soyer and numbered 12/250. Size: 10 3/4 x 13 5/8 inches (plate). Condition: there is a mat stain and discoloration to the paper. Wyndham Lewis "Portrait of Gladys Anne Hoskyns"
Medium: collotype (after the drawing). This large print was issued in an edition of 500 in 1923 for the very scarce "Living Art" portfolio, by The Dial Publishing Company, New York. Printed on wove paper, the total sheet measures 17 x 16 1/2 inches (425 x 415 mm). The drawing itself resides in the collection of The Metropolitan Museum of Art, in New York. Signed by Wyndham Lewis in the image (not by hand). Condition: there are the remains of old tape mounts on back. 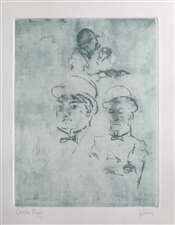 Medium: original etching. Catalogue reference: Morse 128. Printed on laid paper in 1909 by Porcabeuf and published in Paris by Gazette des Beaux-Arts. The plate measures 5 x 7 inches (127 x 177 mm). Plate-signed by John Sloan, not hand-signed. Medium: original etching and aquatint. Catalogue reference: Sanchez and Seydoux 1904-19. Printed in Paris and published in 1904 by Gazette des Beaux Arts. Plate size: 3 1/2 x 6 5/8 inches (88 x 163 mm). A good impression printed on laid paper. Not signed. 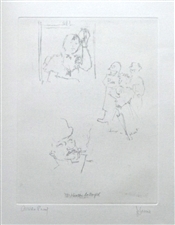 Jack Levine signed original etching "Thieves"
Medium: original soft ground etching, signed in pencil and annotated "Artist's Proof". 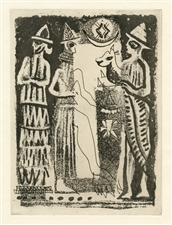 This etching was executed in 1967 for the "Dreigroschen Film" series, for the limited edition portfolio published in 1967 by Touchstone Publishers. The total edition was 145 on handmade BFK Rives wove paper; this impression is one of only 10 artist's proofs. Plate size 11 3/4 x 8 3/4 inches, with full original margins. Jack Levine was inspired by the Berthold Brecht and G. W. Pabst "Dreigroschen Film" of 1930. Jack Levine signed original etching "Tiger Brown"
Edward Wadsworth original woodcut "Landscape: West Riding"
Medium: original woodcut. Catalogue reference: Colnaghi 138. Published in London in 1921 by Herbert Furst at the Little Art Rooms for inclusion in the "Modern Woodcutters 4" volume, now very rare, which showcased original Edward Wadsworth woodcuts. This impression was printed on Basingwerk Parchment wove paper by Walter Bradley at the Morland Press. The image measures 2 1/2 x 4 inches. Not signed. Edward Wadsworth original woodcut "Tarmac"
Medium: original woodcut. Catalogue reference: Colnaghi 137. Published in London in 1921 by Herbert Furst at the Little Art Rooms for inclusion in the "Modern Woodcutters 4" volume, now very rare, which showcased original Edward Wadsworth woodcuts. This impression was printed on Basingwerk Parchment wove paper by Walter Bradley at the Morland Press. The image measures 4 x 5 3/4 inches. Signed in the block, not by hand. Jack Levine signed original etching "Der Kanonen Song"
Medium: original soft ground etching, signed in pencil and annotated "Artist's Proof". 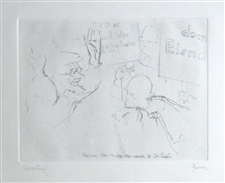 This etching was executed in 1967 for the "Dreigroschen Film" series, for the limited edition portfolio published in 1967 by Touchstone Publishers. The total edition was 145 on handmade BFK Rives wove paper; this impression is one of only 10 artist's proofs. Plate size: 8 3/4 x 11 3/4 inches, with full original margins. Jack Levine was inspired by the Berthold Brecht and G. W. Pabst "Dreigroschen Film" of 1930. Jack Levine signed original etching "Victoria's Jubilee"
Medium: original soft ground etching, signed in pencil and annotated "Artist's Proof". 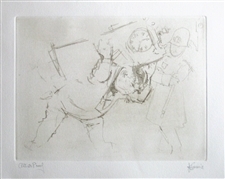 This etching was executed in 1967 for the "Dreigroschen Film" series, for the limited edition portfolio published in 1967 by Touchstone Publishers. The total edition was 145 on handmade BFK Rives wove paper; this impression is one of only 10 artist's proofs. Plate size 8 3/4 x 11 3/4 inches, with full original margins. Jack Levine was inspired by the Berthold Brecht and G. W. Pabst "Dreigroschen Film" of 1930. 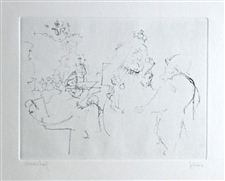 Jack Levine signed original etching "A Wedding Gift"
Medium: offset lithograph (after the drawing). A rare and interesting work for collectors of Raphael Soyer. This is an actual birth announcement, designed by the artist for his friends. The lithographed inscription reads, "Dr. and Mrs. Arnold Lieber announce the birth of their son David. May 17, 1962". The total sheet measures 9 1/4 x 5 3/4 inches. Not signed. Condition: there is a natural crease in the center where it was folded, and a small stain near the right edge of the sheet. Jack Levine signed original etching "Jonathan Jeremiah Peachum"
Jack Levine signed original etching "Jenny Visits McHeath"
Jack Levine signed original etching "Peachum tries to stop the march to St. Paul's"
Jack Levine signed original etching "Mack sees Polly Peachum"
Jack Levine signed original etching "McHeath Betrayed"
Jack Levine signed original etching "Tunbridge Girls with McHeath in Flight"
John Marin lithograph "The Lions, in the Ring"
Medium: lithograph (after the watercolor). Issued in 1950 in a limited edition of 125. The image size is 7 3/4 x 10 inches; the full sheet measures 10 x 12 1/2 inches. Signed by John Marin in the plate, not by hand. 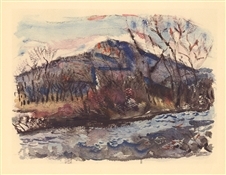 John Marin lithograph "Ramapo River"
Medium: lithograph (after the watercolor). Issued in 1950 in a limited edition of 125. The image size is 8 x 10 3/4 inches; the full sheet measures 10 x 12 1/2 inches. Signed by John Marin in the plate, not by hand. 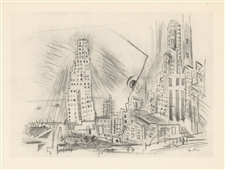 John Marin "Sky-Scrapers Lower New York City"
Medium: collotype (after the drawing). Issued in 1950 in a limited edition of 125 on watermarked Johannot wove paper. The image size is 7 x 9 3/4 inches; the full sheet measures 10 x 12 1/2 inches. Signed by John Marin in the plate, not by hand. 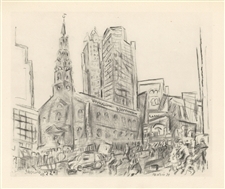 John Marin "St. Paul's Lower New York City"
Medium: collotype (after the drawing). Issued in 1950 in a limited edition of 125 on watermarked Johannot wove paper. The image size is 7 3/4 x 9 3/4 inches; the full sheet measures 10 x 12 1/2 inches. Signed by John Marin in the plate, not by hand. 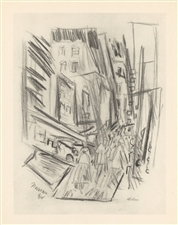 John Marin "Nassau Street NYC"
Medium: collotype (after the drawing). Issued in 1950 in a limited edition of 125 on watermarked Johannot wove paper. The image size is 9 3/4 x 7 3/8 inches; the full sheet measures 12 1/2 x 10 inches. Signed in the plate, not by hand. 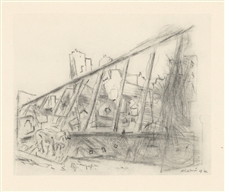 John Marin "Street Movement Lower New York"
Medium: collotype (after the drawing). Issued in 1950 in a limited edition of 125 on watermarked Johannot wove paper. The image size is 7 1/4 x 9 1/4 inches; the full sheet measures 10 x 12 1/2 inches. Signed in the plate, not by hand. 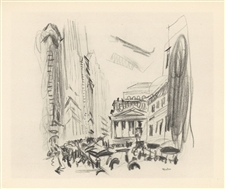 John Marin "Broad Street NYC"
Medium: collotype (after the drawing). Issued in 1950 in a limited edition of 125 on watermarked Johannot wove paper. The image size is 7 3/4 x 9 1/4 inches; the full sheet measures 10 x 12 1/2 inches. Signed in the plate, not by hand. Medium: collotype (after the drawing). Issued in 1950 in a limited edition of 125 on watermarked Johannot wove paper. The image size is 6 1/4 x 7 3/4 inches; the full sheet measures 10 x 12 1/2 inches. Signed by John Marin in the plate, not by hand. Medium: collotype (after the drawing). Issued in 1950 in a limited edition of 125 on watermarked Johannot wove paper. The image size is 6 x 8 1/4 inches; the full sheet measures 10 x 12 1/2 inches. Signed by John Marin in the plate, not by hand. 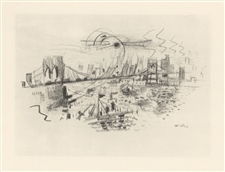 John Marin "Bridge and Street Lower New York City"
Medium: collotype (after the drawing). Issued in 1950 in a limited edition of 125 on watermarked Johannot wove paper. The image size is 7 1/4 x 9 3/4 inches; the full sheet measures 10 x 12 1/2 inches. Signed by John Marin in the plate, not by hand.